I decided to start documenting some of the bilingual products that catch my eye and make me laugh such as this one. Our family from Ecuador brought us some Ahi casero. We use it with ceviche and it is quite yummy. It is brand names like this one, SNOB, that make me wonder if marketers are actually thinking about our global economy. In addition to the fact that English is a highly sought out language in business. So maybe the products have been around for decades, but still it’s something to think about. It doesn’t just happen with English words. There’s MENSA, the high IQ society, which means the equivalent to dummy in Spanish! This one may even take the cake. Kind of makes you wonder about the founders IQ, no? These are just a few of the bilingual words that catch my eye and make me laugh. They always have. I, now, finally have a venue to share it with! Be on the look out for bilingual products and share them with me. I plan on posting more that catch my attention. Language Instinct-it’s not just the title of the book I have started reading. This is hilarious! What does SNOB mean in Ecuador anyway? I am from Ecuador too! 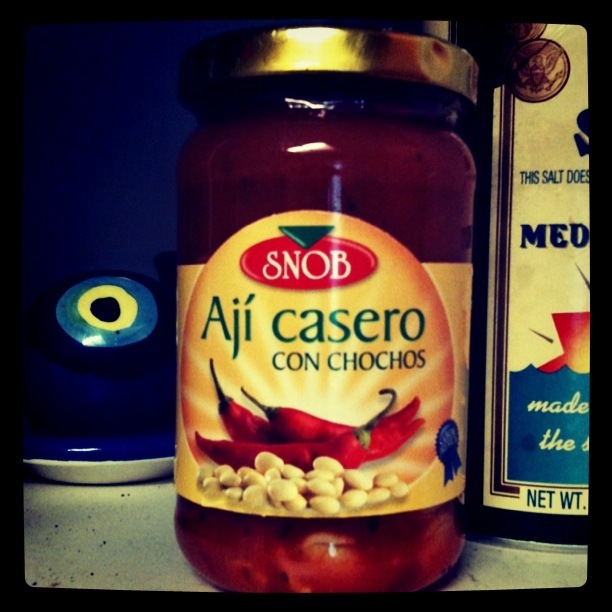 And snob doesn’t mean anything else in Spanish to us other than the brand Snob.